These are Samaipata tours and attractions, places to go and things to do in and around the town of Samaipata. You’ll find more general tourist information on what to take, the weather, and more plus how to get there by bus or taxi and also how to drive yourself. Read up on the history of this archeological finding and who carved the rock. Use the links above and below for more. For a very comprehensive and detailed description of the town of Samaipata itself visit this page. Located 120 kilometers from Bolivia’s largest city, Santa Cruz de la Sierra, the drive to Samaipata is itself one of the region’s main attractions. You’ll leave the city at 440 meters above sea level and head into the foothills of the Andes Mountains climbing gradually of the next three hours to an elevation of 1650 masl. Along the way you’ll see colorful cliffs and formations, quaint rural churches and towns, and other mountain scenery. Cuevas and Waterfalls. About half way to Samaipata you’ll come to Cuevas (The Caves) where you can park your car and take a short hike to a series of 3 beautiful tropical waterfalls. It’s a nice place to picnic along the way and enjoy the gradually cooling weather. Further down the road and closer to town, the road crosses over another plunging waterfall with a sparkling natural pool right on the side of the road. About 1 hour past Samaipata there is another beautiful waterfall and lagoon called Pajcha. El Fuerte de Samaipata. Of course, Samaipata tours also include a visit to El Fuerte de Samaipata, the town’s primary attraction. 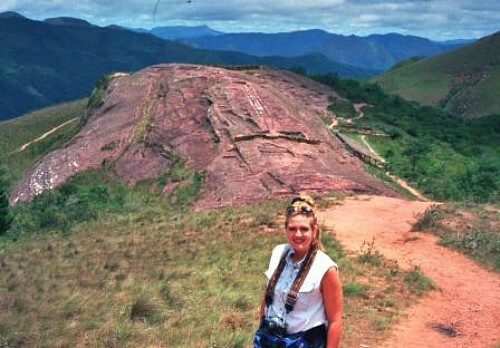 The origins of this enormous carved rock (the largest in the world) are not fully known; however, it appears to have been an ancient ceremonial site carved initially by the Chané and occupied later on by the Incas, the Chiriguanos (Guaraní) and Spanish colonists. Samaipata Village. The town of Samaipata itself is small (but growing) and you can spend some time at it’s central plaza surrounded by a church, a school, cafés and restaurants, an internet café and international calling center, and a tourist information office. You can also enter the Catholic Church for a visit (the town also has two evangelical churches). You can also walk and hike around to view the rest of the town, visit different local and foreign-owned restaurants and hostels, or visit the colorful market. Museo Arqueológico. Samaipata has an Archeological Museum that houses artifacts uncovered during the excavation of the Samaipata fort and other findings. It’s a small but interesting place to learn more about the history of this area. It’s located on Calle Bolivar #37. Phone: (591-3) 944 6065. Email: cias@scz.infonet.com.bo and it's open every day 10:00 am to 12:00 noon and again at 2:30 a 6:00 pm. Horseback riding. You can also enjoy exploring the town and its surroundings on horseback. Michael Blendinger Nature Tours offers tours on horseback. Their website is www.discoveringbolivia.com. La Ruta del Vino. The Santa Cruz state government recently initiated a 3-vineyard wine tasting tour to increase tourism to the area of Samaipata. The vineyards are all near the town and include Uvairenda, LandSua and Viña de Vargas. You can tour all 3 or choose just one. The vineyards are all within 6 kilometers of the town. You can contact a local tour operator or go on your own in a taxi. Bird watching and wildlife observation. Samaipata is one of the gateways to Amboro National Park and because of the area’s privileged location between the tropics and the mountains, there is an abundance of fauna and flora to see. Most tour operators offer this type of tour. Camping. If you’d rather do some camping, several of the hostels and hotels have small camp grounds where you can pitch a tent. Samaipata Zoo and Refuge. If you’d rather not trek or hike, bike or ride a horse, but still want to see some of the region’s wildlife, you can visit the small Samaipata Zoo, which actually functions as an animal refuge. Unfortunately Bolivia has a major problem with people extracting birds and animals from their natural homes. It is not uncommon to find endangered macaws, toucans, and even reptiles, monkeys and other wildlife being sold on city streets. When people figure out they will be unable to care for them, they often abandon them or take them to a local refuge. Most animal refuges in Bolivia are privately owned and operated and are always in serious need of donations and/or volunteers to help out. If you are interested, visit the Zoológico El Refugio, located just 2 kilometers from town. Phone: (591-3) 944 6169. Pajcha waterfall. 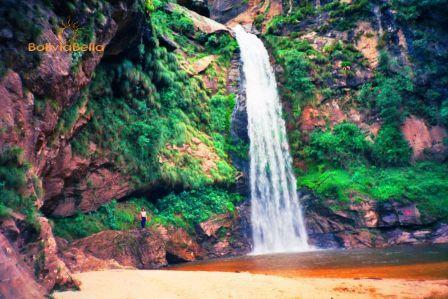 About one hour from Samaipata by road, and with a small amount of hiking, you'll reach the Cascada Pajcha. You'll need to go by car or taxi and from the road it's not a difficult hike. It's a lovely place to have a picnic and swim in the pool at the bottom of the falls (pictured above). If you can spot me on a ledge to the left of the falls, you'll see how high they actually are. But the water below the falls is quite calm. Andean Condor nesting grounds. About 40 kilometers (25 miles) from Samaipata, near San Juan del Rosario and Sivingalito, you'll find what is thought to be the world's largest Andean condor nesting ground. Tour operators normally offer this as a 2-3 day trip and include other activities such as rappeling, and a stop at the Pajcha waterfall. It requires hiking and camping. The Andean condor is the national bird of Bolivia. Amboro National Park is one of Bolivia’s best known and cared-for national reserves. It is home to an amazing array of flora and fauna species, butterflies, orchids, monkeys, and birds. Samaipata is one of the gateways to Amboro National Park. Another, located several hours to the North of Santa Cruz, is Buena Vista. If nature is your thing, trips to and through Amboro are available through almost any operator that offers Samaipata tours. It requires hiking and camping. La Ruta del Ché. A popular tour in Bolivia is the Che Guevara Trail (Ruta del Che). You’ll spend several days walking and hiking, retracing the steps this Argentine guerilla leader took until you reach the place where he was shot to death by the Bolivian military. Read more about Che Guevara and the Che Guevara Tour here. Refugio Volcanes is an area of gorgeous mountain views with deep valleys and steep rounded plateaus. Refugio Volcanes is a part of Amboro National Park and offers beautiful panoramic views, hikes, treks and even nighttime moonlit walks. Bolivia is home to 35% of the Earth’s plant and wildlife, and these tours are especially wonderful for those who are interested in bird watching and wildlife observation. Laguna Volcán Eco Resort near Bermejo, offers spectacular views of the red clay canyons. Here you can hike, swim, and play tennis or golf. The hotel is located right on the shores of a large lagoon formed by water that filled the crater of an inactive volcano. It is located about 38 kilometers from Samaipata. Pinturas Rupestres en Mataral. If rock paintings interest you more than rock carvings, visit the little town of Mataral, about 60 kilometers from Samaipata. Here there are some caves where our human predecessors left some interesting rock paintings of what appear to be faces and other drawings (believed to date back to about 4000 B.C.). The area also has some pretty waterfalls and natural pools. Nearby is the Desierto Mataral, a desert area filled with giant cactus.